This week Drake, French Montana and more came out to support The Weeknd during his homecoming show, and the stars pulled out all the stops for New York Fashion Week. 1. 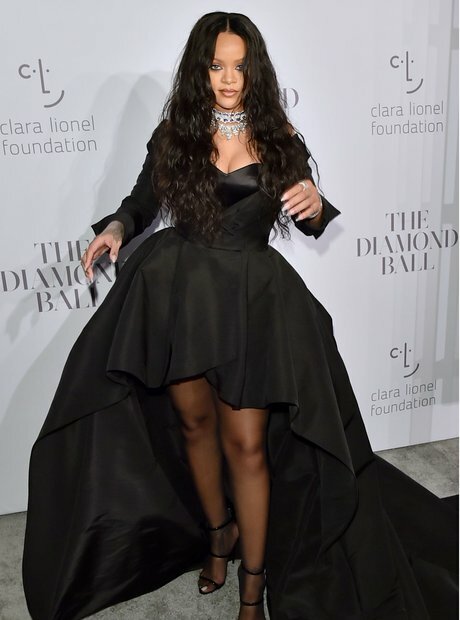 Rihanna arrives at her 3rd annual Clara Lionel Foundation Diamond Ball. 2. Jay-Z and Beyonce were among the notable attendees of the lavish bash. 3. Bey and Ri took a moment to catch up during the ceremony. 5. Rihanna was joined by her family on the red carpet. 6. Cardi B channelled her inner Disney Princess by donning a billowing blue gown. 7. Lil Kim dazzled in a jewel-encrusted outfit. 8. Remy Ma and Lil Kim linked up for some studio time. 9. Drake appeared to be cooking something up in the studio. 10. The 'More Life' rapper linked up with The Weeknd's parents at the singer's homecoming show. 11. Drake later linked up with French Montana, who is one of The Weeknd's support acts. 14. Nicki Minaj posed alongside Rae Sremmurd the Philip Plein SS18 fashion show. 15. The 'No Frauds' rapper later dazzled at a Harper's Bazaar event in New York. 16. Tinashe debuted her daring new platinum pixie-cut hairdo. 17. Rihanna stunned the audience with sensational motorbike displays at her Fenty X Puma SS18 show. 18. Cardi B and Offset attended the star-studded event together. 19. Tyga sat side-by-side with a pilot as he received a flying lesson.